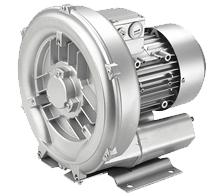 SCB side channel blowers operate completely dry and can be used as compressors or suction units. Built in die casting of aluminium and designed to operate continuously. Guaranteed low noise emission levels. Single stage side channel blowers with a three phase electric motor. 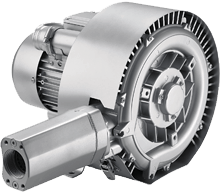 Single stage side channel blowers with a single phase electric motor. Double stage side channel blowers with a three phase electric motor. Double stage side channel blowers with a single phase electric motor.